Need to know how to get a pan out of the pressure cooker? Using electric pressure cookers and multi-cookers like an Instant Pot is easy, and removing a pan from a pressure cooker is easy, too! Today I’m sharing some fun new ideas on how to get a pan out of the pressure cooker. When you’re cooking pot in pot in the pressure cooker, you need a sling or other helper to easily remove the hot pot after pressure cooking. The simplest way to remove a pot is using hot pads or oven mitts, but some pans can be difficult to grip. So for years I’ve been using a foil sling to help lift pans and oven safe dishes out of the pressure cooker. The foil sling works great and I’ll save the foil sling and reuse it several times. But eventually the foil gets discolored and deteriorates. So I decided to explore others options. 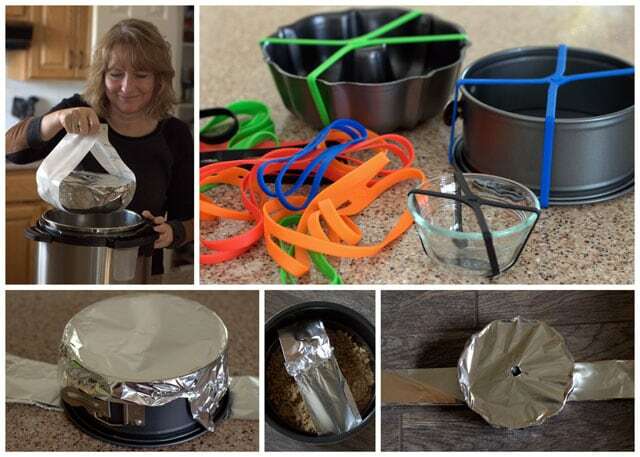 The Instant Pot Facebook Community Group has posted lots of different fun gadgets that they’ve used instead of the foil sling. So I bought several of them to test drive. While I had all the gadgets out on the counter and was taking pictures of them, I couldn’t help but think I’ve got gizmos and gadgets a plenty. The first gadget/idea was my husband’s, as well as a suggestion in the group. Buy a large silicone pastry mat and cut it into strips. I was able to get four strips from one large mat. The advantage of using the silicone sling is it’s long lasting. It doesn’t discolor or deteriorate like foil. The disadvantage is you can’t crimp the ends together above the pan, so it’s best used when your pan is covered with foil. 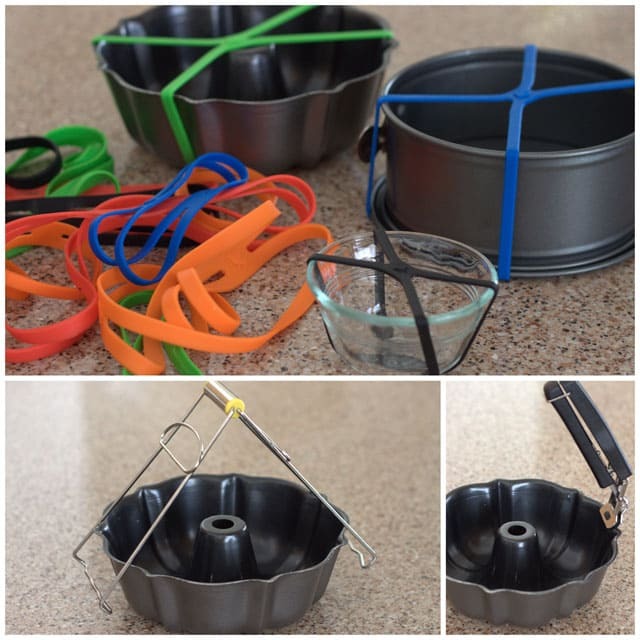 The colorful Grifiti Bands Cross Style Silicone Rubber Bands (on the top in the picture above) work well when your pan is not covered with foil. It’s just a little bit tricker to put the bands around the pan when it’s covered with foil, but it can be done. The bands come in different sizes to work with different size pans. The Plate Retriever Tongs, on the bottom left, work best with a pot that has a rim on it that you can grip and lift. The Retriever Tongs grip the edge of the pan so you can pull it out. It can be hard to angle it just right if the pot is larger and close to the edge of the inner pot. 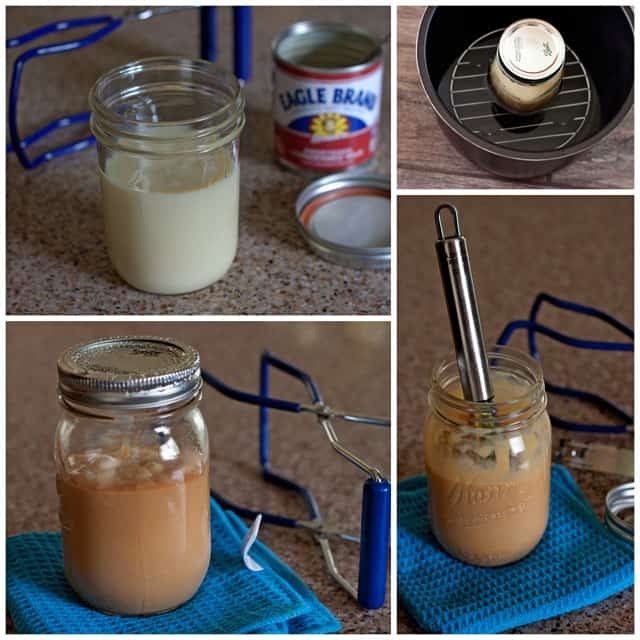 When I made my dulce de leche, I used a canning jar lifter which I already had in my drawer. I also like to use the canner jar lifter to take corn on the cob out of the pressure cooker. So look around your house, you may already have kitchen tools that could do double duty and be a great tool to help you get a pan out of the pressure cooker. OXO recently started selling pressure cooker accessories. My favorite is their Good Grips, Pressure Cooker Bakeware Sling Red. 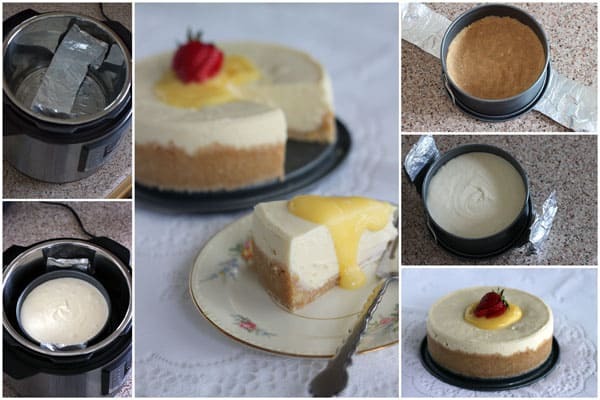 It’s perfect for getting cake pans in and out of the pressure cooker. I especially like that the handles hook together so they don’t interfere with the pressure cooker lid closing. If you need recommendations for pressure cooker accessories, visit my Best Pressure Cooker Accessories post. Now I’d love to hear your ideas. Do you have a favorite gadget or way of getting a pan out of the pressure cooker? Hi Barbara, I live in a small town near Sedona, Arizona and can’t find your book. I am disabled and teaching my husband to cook from my chair in the bedroom. My daughter asked me about a week ago why I didn’t have an Instant Pot She lives in Utah and it is all the rage there. I hadn’t heard of it but I went on line to check it out and realized I have owned the Power Pressure Cooker XL for years but didn’t know what to do with it. We got it out and I have been on line (especially your site and found some pretty good recipes. Now I just have to try and teach him by remote control. I was on Hospice for awhile but by the grace of God I got better. I love to cook and read cook books like novels page by page. He never did cook but with my help and our recipes (yours and mine) he is doing great! Now on to the pressure cooker chapter. After all of that I do have a question. In you gadgets blog you had a picture of the potatoes and eggs going in the IP. What steamer is that and where do I get one. I thought it was the OXO buy it is not. I love your site and can’t wait to get your Cook Book. By the way, my husband did find the IP Miracle cookbook. It is ONLY for the IP and I only found 10 out of 175 recipes that I wanted, and 4 of those were for the slow cooker function of the IP. (It is going back.) Every recipe we have tried of yours has been great. Every one I have looked at I can’t wait to try. You are my kind of cook. Thanks for all the help retraining my guy. P.S. I see I am kind of late to the party, I hope you are still monitoring this site. Thanks for such useful information. Over helpful. Your website will be seeing me in future! I’ve been finding your site tremendously useful…thank you so much! I bought a gadget on Amazon that works like a dream as a sling in my Duo. Even lifts a whole chicken, hallelujah! It’s a silicone 8″ steamer, though I don’t use it for that. The Instant Pot comes with a rack with handles to lower and lift food into and out of the cooking pot, so I’m a little confused why you don’t just use that? I can attest to the fact that it works well; just yesterday I used it for a 7″ springform pan. Hi Claudia – if the handles work for you, that’s great. I just haven’t found them to be very helpful and most racks with other brands don’t have handles. Ah, I see. My Instant Pot Smart came bundled with the mini mitts, which are thin enough that it’s easy to grasp the handles. Hi, will the 7 inch springform pan fit in a 6 quart instantpot? Hi Samina – yes, I use a 7-inch springform pan in my 6 quart Instant Pot. Have fun! Do you leav the foill band for lifting through the entire cooking? Are the silicone bands safe to leave in for the entire cooking process? Hi Cheryl – yes, I leave the foil sling in during the entire cooking. Yes, the silicone bands are safe to leave in for the entire cooking process. What size silicone sling would you use with a 7″ springform pan? Hi Susie – Mine are 17 inches. I clicked on the link to the silicone bands on Amazon, and the biggest one is 12 inches…will that fit? I’m new to your site and also the Instant Pot. I like your helpful tips. I would like to know if those slow-cooker or oven bags would hold up under pressure in the InstantPot? I thought of this idea after tiring of the problematic cleaning and staining in the cooking pot. I have found the best way to clean the blue discoloration is to soak pot with water and vinegar. I noticed when cooking with acidic tomatoes, the pot did not have those stains. Hi Judy – so glad you’re enjoying my site. I asked Instant Pot about it and they haven’t tested them, so there’s no official stance on it. You’d just have to be really careful not to have any of the bag interfere with the lid closing properly, so I don’t know how much benefit they’d be. Thanks for sharing your cleaning tip. I’ll have to try that. Your tips are always so helpful. I’ve been using your simple sling method since I made my first cheesecake last summer, your Meyer Lemon version. BTW, it was my first cheesecake ever and it was perfect, no cracking, perfectly baked, so good. Thanks for that. I have a general question about pan in pot cooking, and didn’t know where else to ask. This seems like a logical place. When cooking things like rice or beans, do I need to follow the same guideline as when cooking directly in the pressure cooker? Fill the bowl no more than half full? My husband bought a pressure cooker. Hi Jewell – yes, all my recipes should be able to be cooked in any electric pressure cooker and most should work well in stove top pressure cookers as well. Have fun cooking! For the silicone sling, I just tuck the top edges down between the pot and the dish so it doesn’t possibly interfere with the cheesecake, or other dishes, while cooking. They cool off quickly and are easy enough to reach to remove the dish. You can also use a hole punch to make a hole in one end to hang it between uses. Thanks for sharing your tips Jeannine! 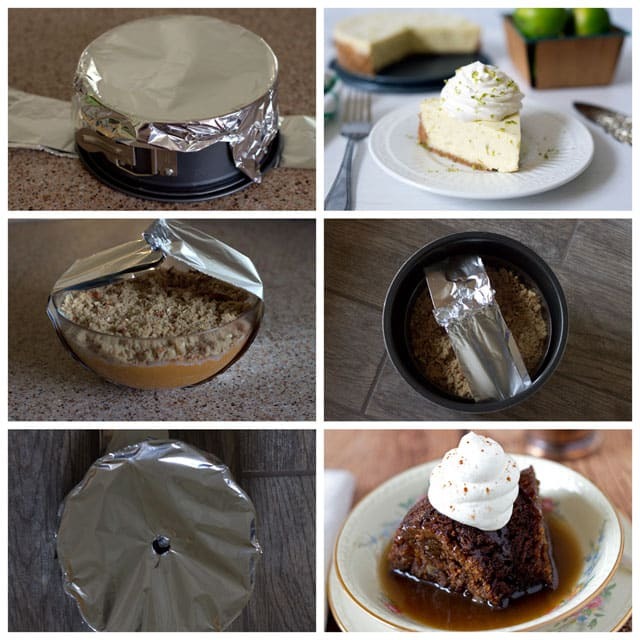 I’ve used your foil sling idea when I made your Pumpkin Pie in the pressure cooker. It worked really well. As with all things that have to be precariously lifted or moved, I held my breath the whole time I was lifting…I do the same thing when I use the steamer basket in the pressure cooker.